Be part of the Arduino (Genuino) Day 2016 community event in Manila! Calling all user groups, makers, students, organizations, associations, teachers, pros, and newbies!. Thinklab is hosting Genuino Day 2016 Manila again this year and we need you to make this the grandest Arduino birthday party to date! We’re bringing the fun and learning to you! Thank you awesome Thinkers for all your support these past six years! 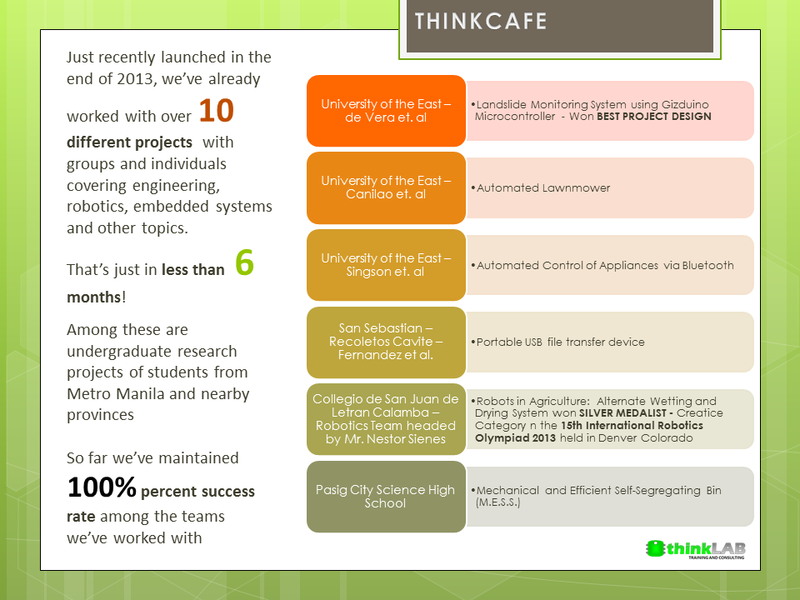 To show our gratitude, we are launching ThinkMOBILE: The Thinklab Discovery Caravan. We will go around the Philippines to bring free workshops, seminars and cool activities to your schools! Thinklab has planned one day of discovery and adventure on Engineering, Science and Robotics, and will travel to at least one lucky school per week. What are you waiting for? Contact your teachers, org officers and/or school administrators and have them to sign up below. We will contact them shortly to schedule the date and discuss other details. Be one of our very first destinations. Together let’s Learn, Create and Innovate. What activities would you like to have? Thinklab is happy to collaborate with PRIMES Learning Company and came up with an amazing tool that helps introduce highschool students to the wonderful world of robotics. Students will get the best foundation in basic electronics, programming and microcontrollers so later on, they can create their own robotics projects. A basic robotics kit can also be purchased along with the workbook for fun hands on activities and exercises. Learn, create, invent and innovate. 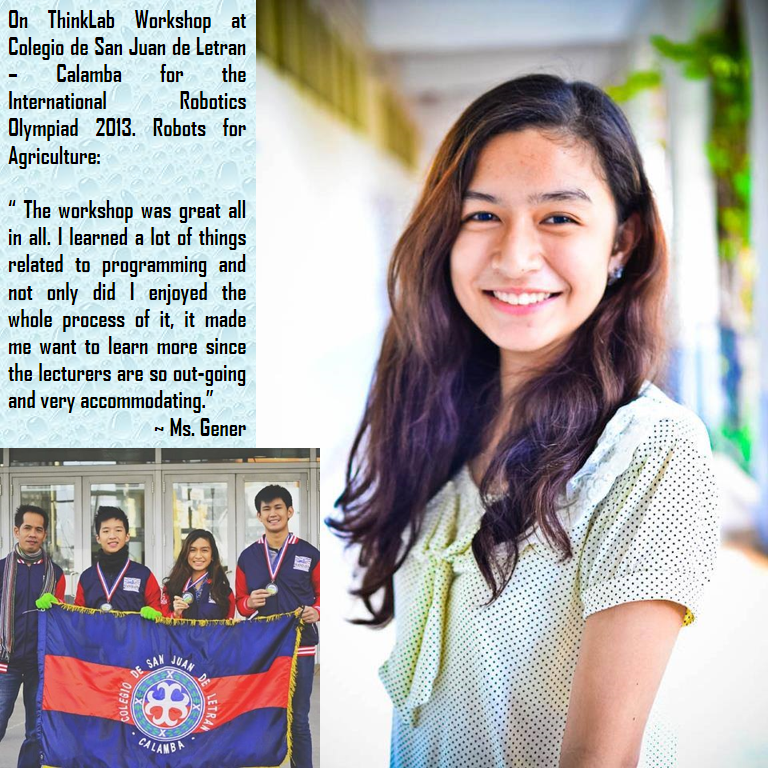 Have an awesome learning experience with Thinklab! Contact Thinklab or email PRIMES at mishel.larracas@primes.com.ph for more info. Good News Thinkers! Another new way to Create, Invent and Innovate! Have you heard about the Raspberry Pi? Thinklab is excited to offer Raspberry Pi Programming and Interfacing Workshop this April 2015! Sign up to receive latest updates regarding this and Register on or before February 28 to avail of our special introductory price! Contact us to know how to secure slots for the workshop and avail of our special promo. · For those who are not attending Day 1, a background in basic Raspberry Pi Programming is required. **Venue and date are final unless participants are notified otherwise. In case of changes, registered participants will be notified via SMS AND email. Arcade cabinets, robots, wearable computers and more built by Pi hobbyists. 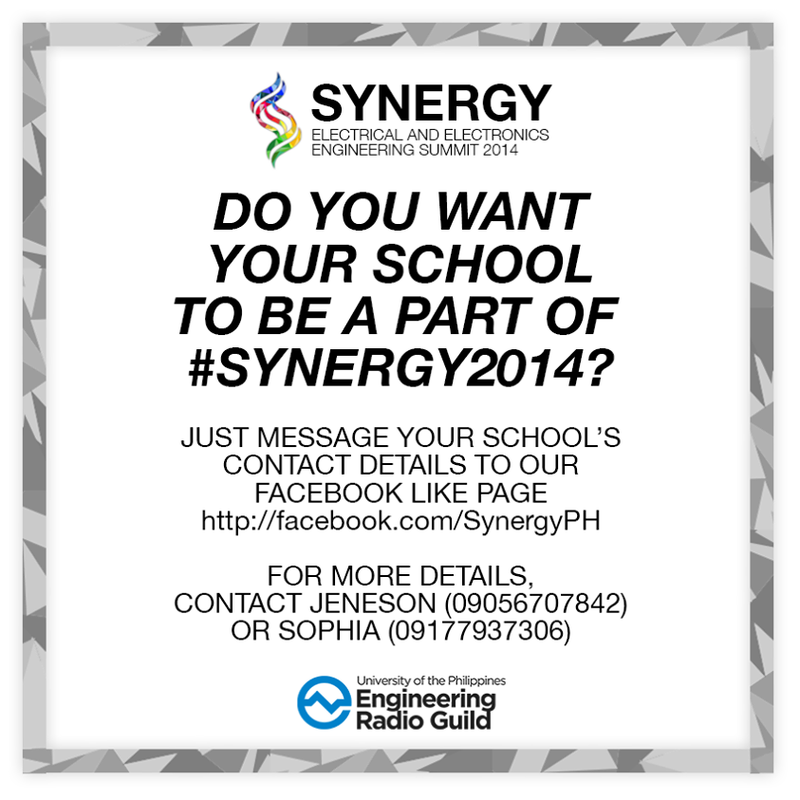 Open to all College Robotics enthusiasts as part of the Synergy: Electrical and Electronics Engineering Summit. 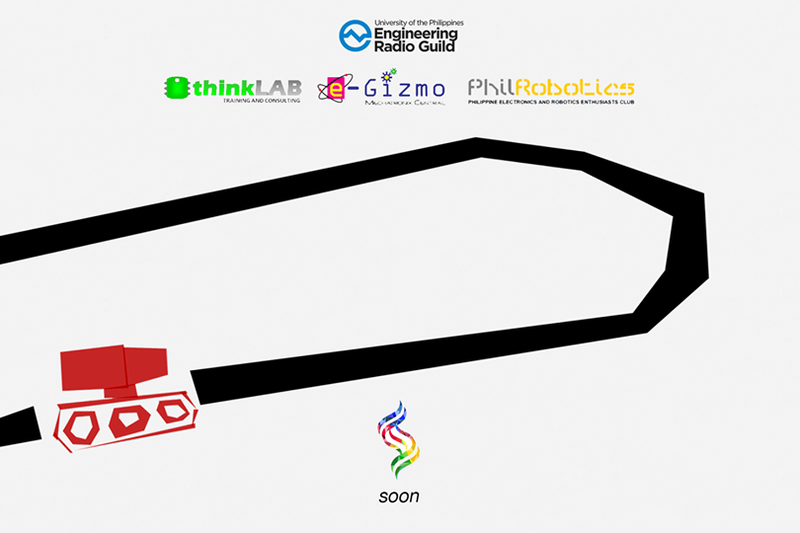 Brought to you by UP Engineering Radio Guild in cooperation with ThinkLab, E-Gizmo Mechatronix Central and PhilRobotics. 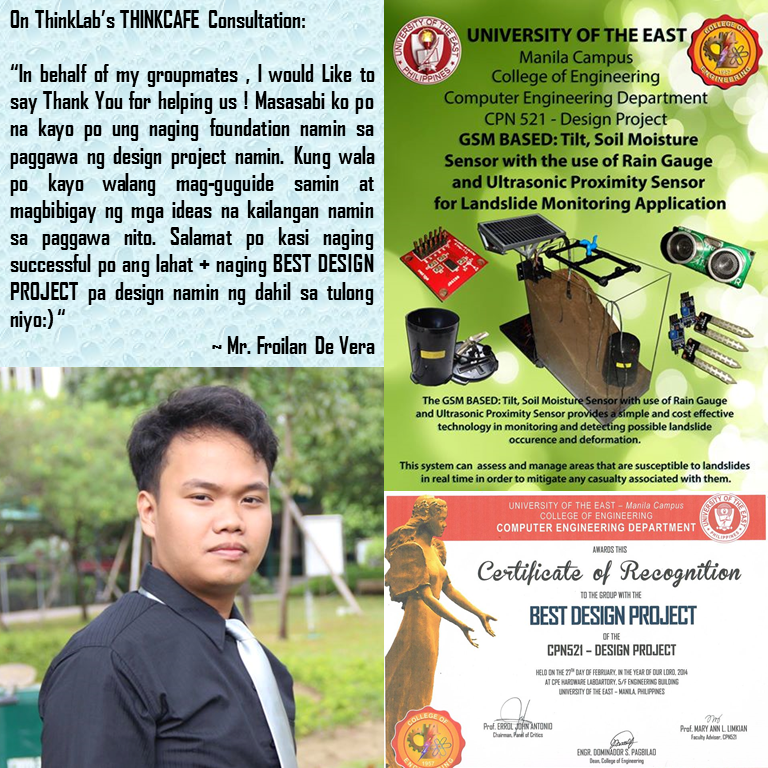 Do you need HELP in your undergraduate research project / thesis? Do you need an IDEA for your thesis topic? Do you need a CONSULTATION on your project concept? Do you need help in making your SETUP work? Do you need a LABORATORY where you can work with your projects? Do you need to DESIGN and FABRICATE the prototypes of your project? If you say YES to any of these, then you would need THINKCAFE! Say NO to those thesis makers! You will not learn ENGINEERING from them! We say, YOU CAN DO IT YOURSELF! 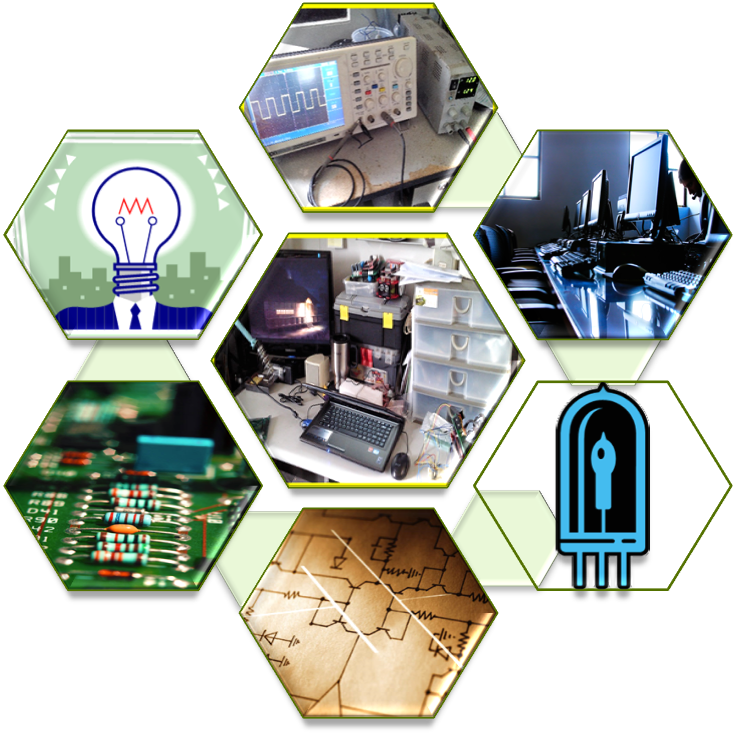 Proper time management plus our EXPERTISE in ELECTRONICS ENGINEERING will make your undergraduate research projects a SUCCESS! 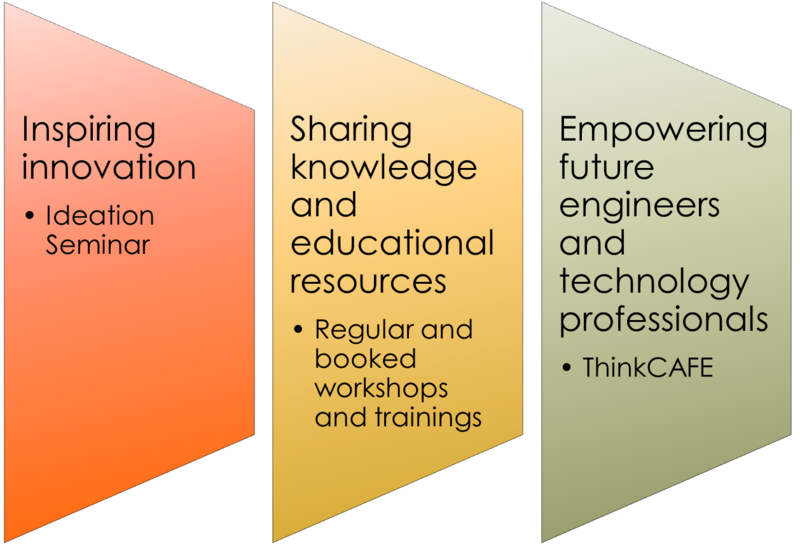 THINKCAFE is an initiative of THINKLAB to HELP industry professionals, hobbyists and especially STUDENTS to build their RESEARCH PROJECTS. + Exclusive invites for ThinkLab events and activities. Contact us to schedule a FREE initial interview and consultation! Always remember, the only limitation to your greatness is you! We will be featuring some of the people we met during our workshops especially those who have been thinking of ways on how to use the knowledge they acquired during our workshops in their everyday lives. These are the people who have been inspired by ThinkLab to INNOVATE! For those who have attended our workshops, you may also create your own videos and articles and send your links to us. Please fill up this form >> SAY HI! and send your links in the message box. We hope to feature more THINKERS in our blog. Have an INNOVATIVE day everyone! This is Ringo Dingrando, a Physics and Robotics Instructor from International School Manila. 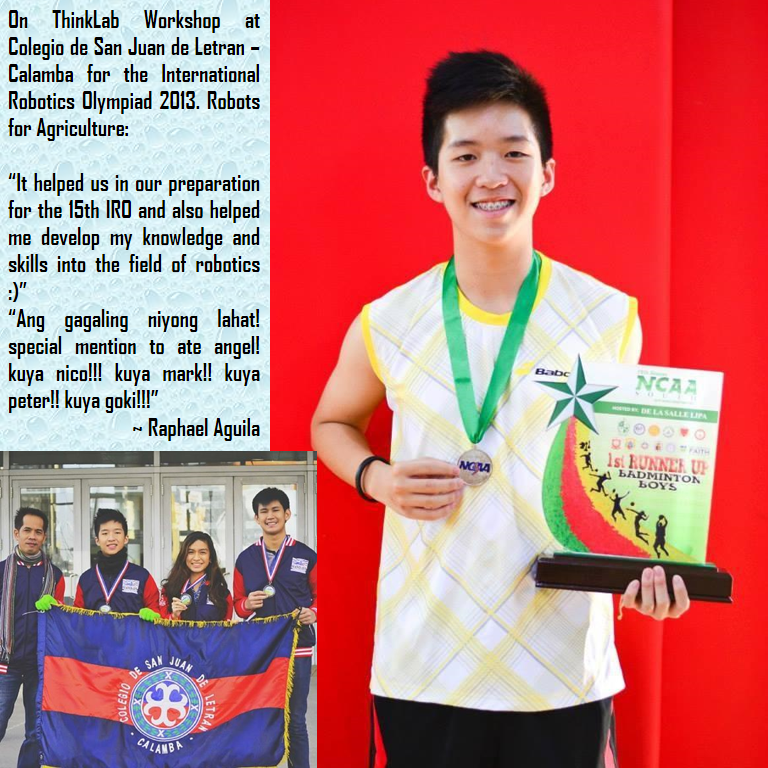 He attended one of our workshops last January 2013. Today he sent us a link of his video of one of his projects using Gizduino. Thank you Ringo and we hope to see your energetic and ecstatic video posts of your projects soon! Wanna be a Certified Thinker? Enrol at ThinkLab Workshops / ThinkCafe today! 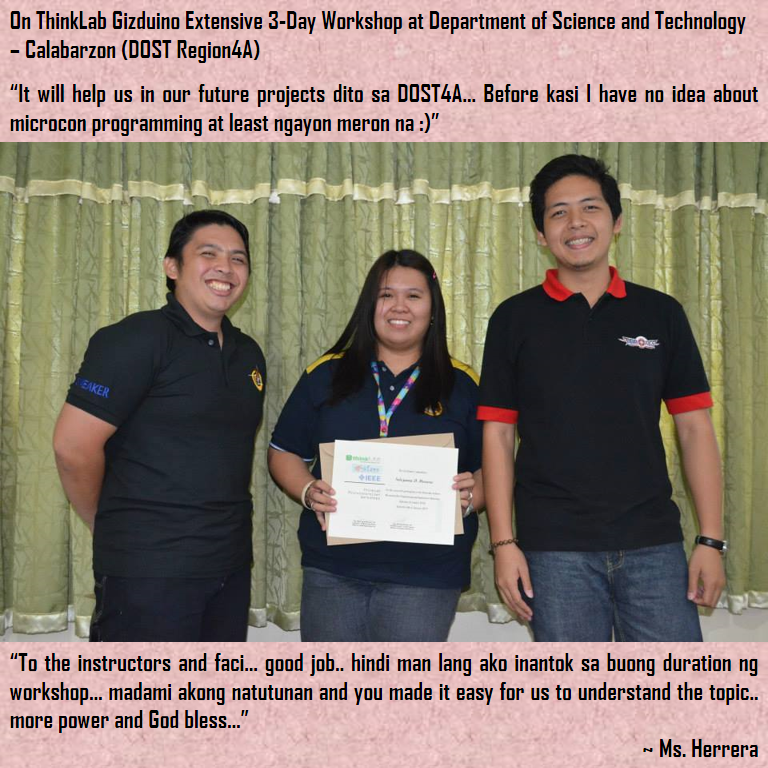 ~ Ms. Chinkee Herrera from Project Assistant III, DOST Region 4a. Wanna be a CERTIFIED THINKER by ThinkLab? Enrol at ThinkLab Workshops / ThinkCafe today! It’s really been a great year for Thinkers and Makers! New gadgets, gizmos and development platforms just keep coming. Thinklab will be having another Raspberry Pi 3 Programming and Interfacing Workshop this year! There will be hands-on activities throughout the workshop, each participant gets to use and take-home your very own Raspberry Pi 3. Pre-register below or buy your tickets now via Eventbrite! Contact us to know how to secure a slot now!